I have had the opportunity to travel nearly 4000 miles in the month of August over a good deal of the drought areas of the Southern Plains and western Great Plains. In one trip I traveled across the Texas Panhandle and made a loop covering much of central and eastern New Mexico. In another trip I traveled across south-central and southwest Nebraska, central and western Kansas, the Oklahoma Panhandle and northwest Oklahoma. Most all of this region is shortgrass native range and a mixture of dryland and irrigated farming. Recent rains have resulted in significant short term improvement in range conditions in much of these regions. The warm-season grasses that make up native ranges in the central and southern Plains typically receive monsoonal summer moisture and will respond with forage growth resulting in high quality forage in the fall and winter. The recent rains do not imply that drought is erased from many of these regions nor that forage production is back to normal after sustained damage from several years of drought. However, the forage growth that does occur will help stabilize the severely reduced herd numbers in the region and may allow for limited heifer retention this fall. Full recovery of these native ranges will require several years but this could be an important first step in that process. With respect to crop production, the recent rains will do little to change the damage already incurred on summer crops, especially corn, though it may help soybean and grain sorghum production in Kansas and southern Nebraska. In southwestern Kansas and northwestern Oklahoma, I saw a lot farming activity as producers were preparing wheat ground for seeding. The improvement in western Oklahoma, combined with the removal of drought in much of central and eastern Oklahoma, provides the best opportunity in several years for wheat pasture grazing in the state. Along with improved moisture conditions, moderate temperatures resulting in cooler soil temperatures provide a better opportunity for wheat producers to plant early for forage production. 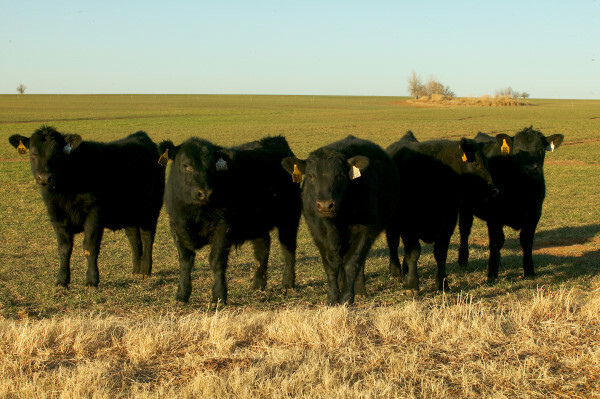 Improved wheat pasture prospects means that good stocker cattle demand will continue to support strong stocker prices this fall. Feeder cattle supplies are limited by a smaller calf crop, more retained heifer demand and fewer imported feeder cattle. Current feeder cattle markets offer good value of gain, especially for feeder cattle marketed at relatively heavy weights. Stocker producers should evaluate a wide range of potential stocker sizes depending on the amount of time (and total gain potential) available. The market generally favors holding lightweight stockers to heavier weights or starting with somewhat heavier beginning weights. Though it isn’t apparent yet, I expect to see heifer prices at less of a discount than typical to steers by next spring. Despite the challenges of high purchase prices and limited feeder supplies, there is considerable opportunity for a wide variety of winter wheat grazing programs.